APSRTC employees can enquire about their pf status using this facility. Go to APSRTC home page given above. Click APSRTC PF Information link available in the left panel. Step 3 : Enter Serial No according to your selection. APSRTC EPF TRUST maintains this site apsrtc.gov.in/rtcpf or your personal information, education and communication. You can freely browse the site. You may download material displayed on the Site for noncommercial, personal use only. The material available from this site is for information only. There may occur any technical problems and so it might happen error in display at some times. 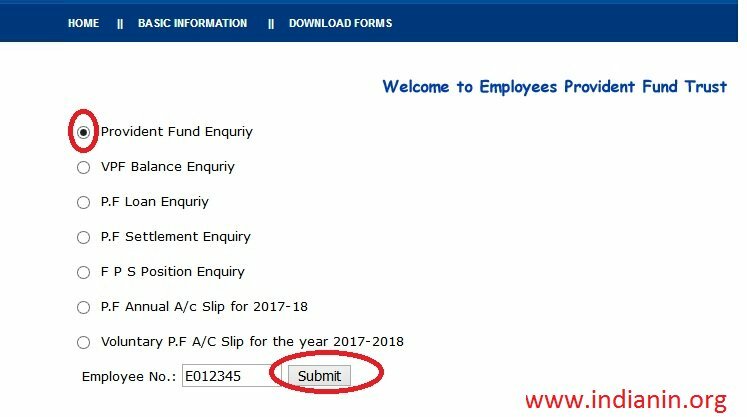 The account details maintained at APSRTC EPF TRUST is final and the account details displayed through this site will not bind on the APSRTC EPF TRUST for any claims. Any discrepancies found may be bought to our notice immediately. ** A passenger who requires to book a ticket has to visit APSRTC Reservation counter or any Authorized Ticket Booking Agent’s counter. ** There is a printed “Integrated requisition form for reservation/cancellation/ postponement/ preponement”. ** The Passenger has to fill up the columns of the form and present it before the reservation clerk/ATB Agent along with fare amount. ** On reaching Tirupati (to avoid waiting in queue for purchase of tickets to proceed to Tirumala), the system of link tickets (Rs.53/- for ordinary and Rs.29/- for Express) to Tirumala has been introduced. These tickets are available at all the advance reservation counters and with the service conductors of Tirupati bound services. ** Similarly, both up & down journeys ticket ordinary Rs.96/- , Express Rs.52/- can be purchased for onward and return journey from Tirupati to Tirumala. (These tickets are sold at all our Bus stations and through conductors of Tirupati bound services). 1. For cancellation of tickets, cancellation fee is calculated on the journey fare applicable, as per the slabs mentioned hereunder. 2. Cancellation of tickets with discounts will be as per the rules in force. 3. Cancellation charges will be worked out on the collected fare of the ticket and refund amount will be fare collected less cancellation fee. Further, cancellation charges are applicable on actual fare only. 4. Reservation fee is not refundable. In case of e-tickets, service charges are also not refundable. 5. To avail refund, tickets should be cancelled more than one hour before the schedule start time at origin of the Service. This bus pass is to travel free from the residence to school and back by ordinary buses upto a maximum of 20 KMs in rural areas and 22 KMs in cities/towns, irrespective of whether the Institution is of Government, aided or private one. The facility is available in cities / towns and in rural areas. Corporation has implemented free travel facility to all girl students up to an upper age limit of 18 years, studying Class X and below. This facility is extended for travel between the residence and school by ordinary services up to a maximum distance of 20 KMs. in rural areas and 22 KMs.in cities / towns. The students studying in the colleges located in cities / towns are issued with slab rated quarterly route bus passes for a minimum slab of 4 KMs. to 22 KMs. maximum. These students are also issued with Monthly as well as Quarterly General bus tickets on the strength of which they are allowed to perform unrestricted journeys in City Ordinary services in Greater Hyderabad, Visakhapatnam, Vijayawada and Warangal. The Students studying in Government, Government aided or private registered school are eligible for which the Head of the School shall certify the date of birth and bonafides of the Students. 1. What are the important bus stations in APSRTC? 2. What are the important facilities provided at these Bus Stations ? ** Display of time table board. 3. Are there any dormitories provided in Bus Stations? Yes, dormitories are provided in Major bus Stations.